Instagram, which has been adding features an impressive clip, is getting a few more today. First up, you can now add stickers to your video and photo stories. Yep, just like Snapchat. Again. 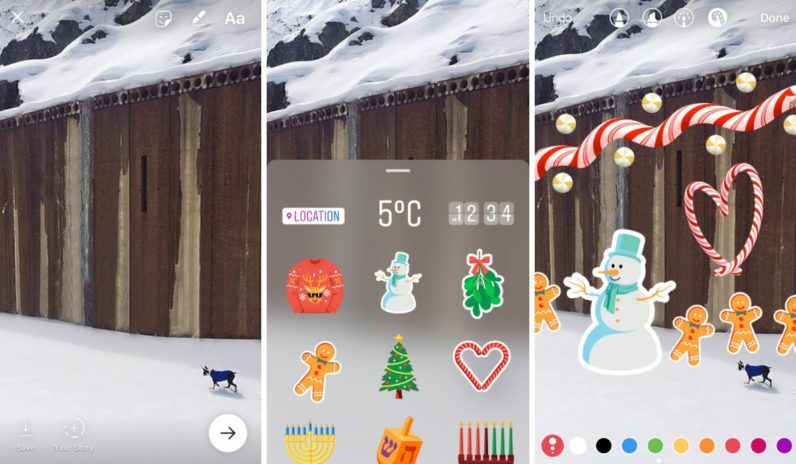 The sticker button shows up next to the drawing tool (it’s the smiley face one), although as the company has been wont to do, it’s adding its own twist on Snapchat’s implementation by including specific stickers for the weather, current time and location. Snapchat has filters for those sorts of variables, but filters are fixed, while stickers can be moved around and resized. Of course, there are a bunch of holiday stickers ready to go. You know, Christmas, Hannukah and all. On a separate note, Instagram has now added a “hands-free” for video recording. That’s a bit misleading; all it means is that you don’t have to hold down the video button to record a video anymore. Just tap once to start, and tap again to finish – like, you know, your regular camera app already does. Sarcasm aside, now you can record videos of yourself doing things without having to hold onto your phone the whole time. You can also add more text to your photos and videos – tap the text button to keep on adding more instances. There’s a new slider that lets you adjust the text size too, including automatic text wrap so it’s not chopped off the sides of your screen. One last tidbit for iOS users only: You can now save your entire story from the past 24 hours as a single video. The features are rolling out to the latest versions of Instagram (10.3) for iOS and Android today.